You can easily take advantage of learning Fort Worth's history, its depth of character and its uniqueness during this 4-hour guided, small-group tour. After its birth in the 1840s, and especially between 1866 and 1890, drovers ran millions of cattle through Fort Worth on to the Red River, winding their way north to the rail heads in Abilene, Kansas via the Chisholm Trail. Please contact local supplier to confirm. Lunch is not included in this tour. You and your small group will depart from Platinum Park to begin your 4-hour tour with a historian as your guide. This 125-acre venue is one of the most popular stops in Fort Worth and is home to the world’s only cattle drive. 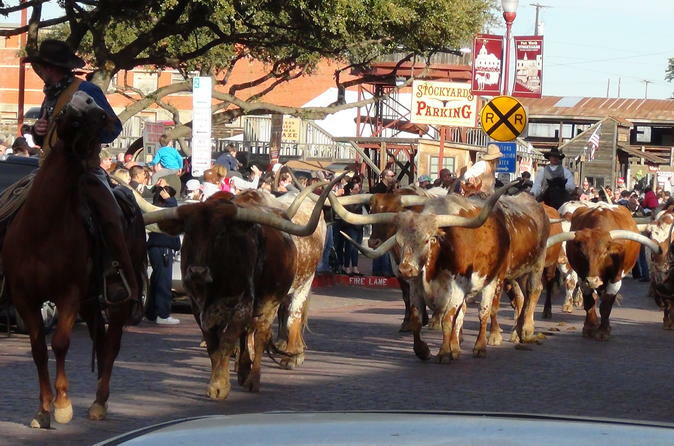 You may not drive cattle, but you can still have a great time during this historic walking experience.